Nancy Gertner and Alan Dershowitz. Some spirited sniping between two Harvard Law School giants might be funny in some context, were the fate of Western democracy not potentially tottering in the balance. In an Ali-Frazier battle of legal minds, former federal judge Nancy Gertner this week smote celebrated legal scholar Alan Dershowitz in the opinion section of The New York Times, accusing him of falsely smearing Robert Mueller, the special counsel investigating Russian interference in the 2016 election and whether or not the Trump campaign was in on it. Gertner and Dershowitz are longtime friends, but the highbrow exchange had an edge. Gertner, a senior lecturer at Harvard Law School, lumped Dershowitz, the loquacious Harvard law professor emeritus, in the same paragraph with partisan mouthpieces Rush Limbaugh and Sean Hannity. Dershowitz, in his defense, suggests Gertner is in the throes of an anti-Trump fever, clouding her judgment. Their argument is over Mueller’s role as a federal prosecutor in Boston, where he served in several positions from 1982 to 1988, including acting US attorney. The dispute is hardly academic. It involves the Russian investigation and the ongoing probe into President Trump’s associates, which could potentially upend the Trump presidency, as well as the gathering threat of a constitutional crisis if Trump orchestrates Mueller’s removal and shuts down the investigation. Trump’s defenders have alleged that Mueller looked the other way and allowed four innocent men to languish in prison to protect the cover of an FBI informant, in a notorious case from the era of the agency’s corrupt relationship with mobster James “Whitey” Bulger. The Globe reported last week that there is no evidence linking Mueller to the case of the men wrongly imprisoned. “There is no evidence that the assertion is true,” Gertner wrote, explaining that as a judge she presided over a federal lawsuit against the government related to the case, ultimately awarding the plaintiffs more than $100 million. In the “voluminous evidence” gathered for the trial — all of which Gertner read, she said — Mueller was never mentioned. Nor was he mentioned in the submissions of the plaintiff’s lead lawyer, nor in “Black Mass,” a book about Bulger and the FBI by former Globe reporters, Gertner wrote. Dershowitz, she said, asserted something that was untrue, and — as someone with vast experience on the topic — Gertner felt it was her responsibility to correct the record. Dershowitz said Gertner’s column is not so much about Mueller as it is about Trump. “She has allowed her legitimate partisan concerns to trump her skepticism about the government,” he said in an interview. Mueller, he said, has held numerous leadership positions in the FBI through which he could have learned about the nature of the case. He has called for an investigation by the Justice Department’s inspector general to determine if Mueller has any responsibility. Gertner and Dershowitz have been fixtures in the legal community for decades. A longtime federal judge, Gertner came to Harvard after retiring from the bench in 2011. Dershowitz, a famous defense attorney, joined the Harvard Law School faculty at age 25 and is now an emeritus professor. Dershowitz appears to have Trump’s ear, and dined with the president at the White House earlier this month. He says they spoke about the Middle East, but he’s been offering advice to Trump about his ongoing legal problems on television and to reporters, as well. This is not the first time Dershowitz and Gertner have battled in the media. 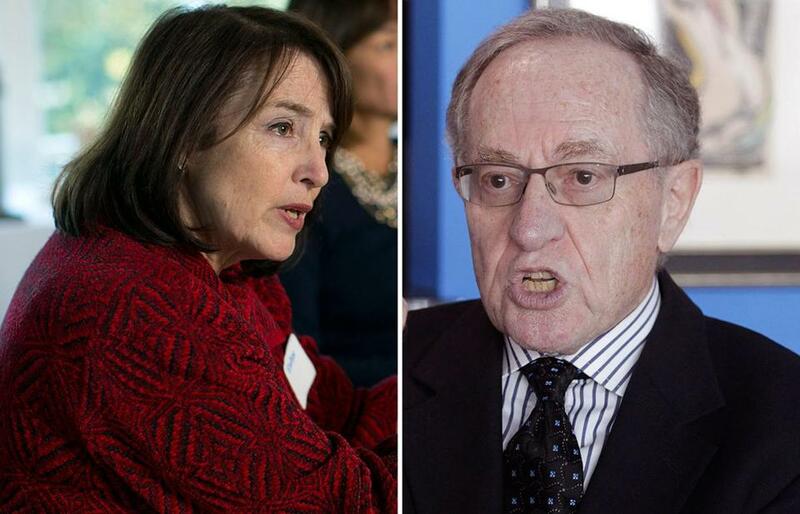 Dershowitz recalled a radio clash with Gertner on WBUR last year, which began with a pointed discussion about Dershowitz’s assertion that a grand jury in Washington, D.C., gives prosecutors a tactical advantage over a grand jury in another location, because citizens of the Democratic stronghold with a large black population would be more likely to indict a Trump associate. That exchange ended with Gertner declining to say whether she thought Dershowitz was a racist. After all this, are they still friends? “Yes,” said Dershowitz. “We go back a long, long time. We’re friends and we have disagreements.” He said he will write a response to Gertner’s op-ed. How about you, your honor? What is the state of the friendship?